It’s only April 3rd, but the free agent market is going full bore already. I will do my best to track who is coming and who is going and will try to make it a weekly thing. So let’s take a look at what’s going on in Hot Stove College Basketball. Jordan Nwora-Louisville: Nwora was the breakout player of the year in the ACC this season. On March 28th he announced he was test the NBA waters while maintaining his eligibility. The 6’7 wing averaged 17 points and 7.6 rebounds per game and shot 38.8% from deep during his two seasons in Louisville. To me he projects as an NBA player, but he could seriously up his profile next year when he will be the leader of a Cardinal team that will be loaded with young talent. I still think he has yet to hit his ceiling. He is currently projected at #24 to the Cavaliers. Expectation: I would like to see him return, but if his first round projection holds, he’s probably gone. Oshae Brissett-Syracuse: For the second consecutive season, Brissett will test the NBA waters. He probably should have stayed in last season as his weaknesses from behind the arc were on full display this season. He averaged fewer points, rebounds and steals per game and shot worse from deep and the stripe in his second season. His offensive rating fell and his defensive rating rose, the opposite of what you want. Expectation: He should come back and he is a better player than he showed this year. He doesn’t currently appear on the mock draft board so I think he returns. Jalen Lecque-North Carolina State: The five star recruit hasn’t even set foot on the Raleigh campus and he’s already thinking about leaving. He is maintaining his eligibility right now so that is some solace for Wolfpack fans. The scouting report on Lecque is that he is super athletic, but can’t really shoot all that well. In today’s NBA you have to be able to stretch the floor. Expectation: I think he receives feedback on what he needs to work on and becomes a regular on Sportscenter in a Wolfpack uniform next winter. Nassir Little-UNC: This one was a no brainer. He is athletic, he is still learning and he can play three positions when his jumper improves. He never quite fit at UNC, but towards the end of the season he started to adjust his game and made a huge impact, especially in the first weekend of the dance. Expectation: He’s a top 10 pick all day. Ky Bowman-Boston College: He probably should have left last season. Right now he is projected as a mid second round draft pick. His numbers improved during his junior season, but Boston College was a bad team. The upside is that his counting numbers are still impressive and he has great range. He is also the best rebounding guard in the country. In 2018-19 he averaged 19 points, 7.5 rebounds, 4 assists, 1.4 steals and shoots the deep ball at 39%. Expectation: He could work his way into the late first, early second. This guy will make a living playing ball somewhere. Coby White-UNC: We all knew this one was coming, the kid was a superstar. The news that he was declaring actually came through while I was writing the Bowman part. The all time leading scorer in North Carolina high school history averaged 16.1 points, 4.1 assists and 3.5 rebounds while shooting 35% from deep and 80% from the stripe. At 6’5 his size will be utilized more at the NBA level than it ever was in Chapel Hill. Expectation: Top 8 pick This kid is a star. 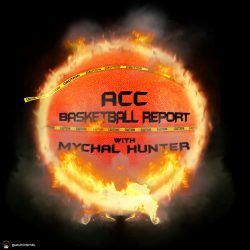 Anthony Mack-Miami: This is an interesting one. He red-shirted at Wyoming due to an injury and transferred to Miami. After receiving a waiver to play immediately and Miami suffered some bad luck injury wise, he was thrown directly into the fire. He started seven games and while he isn’t a star, he is a player. He would provide the ‘Canes with quality depth next season. This is a bad loss, especially when you consider Zach Johnson is also gone. He is originally from Vegas and originally attended Wyoming, expect him to land in the Pac-12, MW or WAC. Curtis Haywood II-Georgia Tech: I wasn’t shocked by this. The writing was everywhere, the wall, the body language even a cryptic post on twitter shortly after the season ended. CGB is a great defender and has potential to be a knock down shooter. He has the ability to impact the game without scoring a point and someone is going to utilize him properly. His family is from Oklahoma, but he prepped in New Hampshire. I think he could end up anywhere, but he could have a huge impact at the mid major level. DJ Harvey-Notre Dame: I was struck by this one. Harvey seemed like an ultimate team guy. The interesting part of this is that it seems like DJ is simply playing the field. No coaches have left the Notre Dame bench yet, though Rod Balanis has been rumored at some mid major positions. Harvey has not ruled out returning to Notre Dame so I don’t really know what to make of this other than he is looking for a specific school to offer him a home. He isn’t a great shooter, but he is a great tough shot maker. This would be a huge loss for the Irish.